Formed 1 Apr 1936 in Wörzburg. On 1 Oct 1937 redesignated Stab/Aufkl.Gr.25. Reformed 1 Apr 1941 in Kiel-Holtenau. 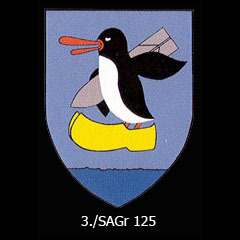 On 13 Jul 1943 redesignated Stab/SAGr.125. Formed 1 Jul 1935 in Wörzburg from 1./Aufkl.Gr.525. On 1 Oct 1937 renamed 1./Aufkl.Gr.25. Reformed 1 Apr 1941 in Kiel-Holtenau. In Jul 1943 was used to form 2./Kü.Fl.Gr.706. Reformed Jul 1943 in Sevastopol as 1./SAGr.125. * probably also used other bases while in Norway. Formed 1 Apr 1936 in Wörzburg. On 1 Oct 1937 redesignated 2./Aufkl.Gr.25. Reformed 1 Apr 1941 in Thisted from 4.Erg./BFGr.196. On 13 Jul 1943 renamed 2./SAGr.125. Formed 1 Apr 1936 in Juterbog. On 1 Nov 1936 redesignated 2./Aufkl.Gr.Juterbog. Reformed Jan 1937 in Wörzburg. On 1 Oct 1937 renamed 3./Aufkl.Gr.25. Reformed 1 Apr 1941 in Kiel-Holtenau. On 13 Jul 1943 renamed 3./SAGr.125.